The R-word is a euphemism for retard and retarded, words that are considered offensive and disrespectful when used to describe or insult individuals with intellectual disabilities or to insult people, places, and things by comparing them to individuals with intellectual disabilities. The campaign against the R-word comes at a time when the term mental retardation is also falling out of use, increasingly replaced by intellectual disabilities or cognitive disabilities in medical and legal language. Where Did the R-Word Come From? The word retard means to hinder or to make something slow. Mental retardation was introduced as a medical term for people with intellectual impairments, replacing terms that were considered to be more offensive. It was introduced as a neutral term by the American Association on Mental Retardation in 1961 and was adopted by the American Psychiatric Association in their Diagnostic and Statistical Manual for Mental Disorders (DSM). The word retard came to be used as an insult, tossed around the playground as a synonym for stupid or idiot. It was not respectful of those with intellectual disabilities to have the word used in that way, even if the taunter wasn't aiming the insult at that group. As advocates began to work at changing the medical terminology, Rosa's Law was passed in 2010 to eliminate all references to mental retardation in U.S. federal law, replacing it with the term mental disability and "an individual with an intellectual disability." New terminology was also adopted for the DSM-5 in 2013 and in the 11th edition of the International Classification of Diseases (ICD-11) in 2015, replacing mental retardation with intellectual developmental disorders and intellectual disability. You may find yourself challenged when you use the older term in a medical or legal sense without meaning it as an offense. Protests over the use of the R-word in the movie Tropic Thunder grew into a movement to remove those words from common speech. 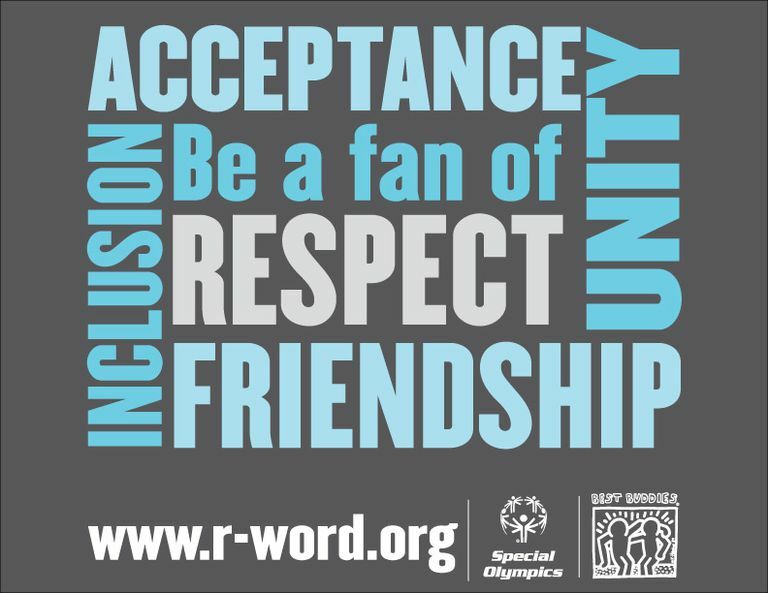 Special Olympics started a campaign at r-word.org asking people to pledge to stop using the R-word, with a particular push in March of every year to "Spread the Word to End the Word." The site offers resources for those who wish to encourage others to take the pledge. Lauren Potter, an actress with Down syndrome who played cheerleader Becky on Glee, made a PSA denouncing the R-word that can be seen along with many other videos on R-word.org's YouTube channel. Though many folks who defend the use of the R-word claim that such efforts mean "you can't say anything anymore," there are in fact many less-offensive words that work as substitutions. Check the list of 225 options to make your speech more varied and less hurtful. As you teach your children what is proper to say, coach them not to use the R-word, just as you would stop them from using a racial or ethnic slur. If you hear a child or adult using it, consider it a teachable moment and update them that is no longer an acceptable term.